According to recent statistics, subclinical hypothyroidism may be more common than type 2 diabetes. In this podcast Dr. Amy Nett and I will discuss the thyroid physiology behind subclinical hypothyroidism and its clinical consequences. Whenever we talk about thyroid function, we’re generally looking at lab values or certain markers, and in particular, we’re talking about TSH, or thyroid-stimulating hormone, and in the case of subclinical hypothyroidism, TSH is high, but the thyroid hormones, specifically, free T3 and free T4, can still be in the normal range. Chris Kresser: Hey, everyone, it’s Chris Kresser. Welcome to another episode of Revolution Health Radio. Today we have Dr. Amy Nett, our staff physician from the California Center for Functional Medicine, whom you’ve met before if you’ve been listening to the show. We had Dr. Nett on previously, and this episode we’re going to talk about subclinical hypothyroidism, which is an issue we see a lot in our patients at the clinic, and so I thought it would be a good idea to have Amy on to talk about this a little bit further. So, Amy, welcome again to Revolution Health Radio. Dr. Amy Nett: Well, thank you and thank you for having me on the podcast again. I think this is a great topic to talk about because, as you mentioned, we see it a lot in the clinic and it’s increasing in the US adult population, so something that I think we all need to dive into a little bit more. Chris Kresser: Yeah, let’s start there. We know now, at least according recent statistics, that this may even be more common than type 2 diabetes, which is, of course, an epidemic problem. Dr. Amy Nett: Exactly, it is, so let’s first also just define subclinical hypothyroidism so people know what we’re talking about. Whenever we talk about thyroid function, we’re generally looking at lab values or certain markers, and in particular, we’re talking about TSH, or thyroid-stimulating hormone, and in the case of subclinical hypothyroidism, TSH is high, but the thyroid hormones, specifically, free T3 and free T4, can still be in the normal range. Chris Kresser: Right, and even just to take a step back a little bit further for those of you who are not familiar with thyroid physiology and how it works, it can get a little complex, so we’ll just keep it simple for the sake of this discussion, but I want to give you a quick overview so you’re not completely lost while you’re listening to this. Thyroid-stimulating hormone is the hormone that’s secreted by the pituitary gland, and its job is to tell the thyroid gland how much thyroid hormone to produce. The pituitary is kind of like the control tower that monitors thyroid hormone levels in the blood, and if they’re low, what it will do is produce higher amounts of TSH, or thyroid-stimulating hormone. It’s kind of like shouting at the thyroid gland to tell it to make more thyroid hormone. On the other hand, if thyroid hormone levels are high in the bloodstream due to hyperthyroidism or maybe doses of thyroid medication that are too high, you’ll see TSH drop because the pituitary is naturally trying to limit the amount of thyroid hormone that’s produced by the thyroid gland. So just keep that in mind. When we’re talking about high TSH, sometimes people get confused because that might sound like hyperthyroidism if you’re not familiar with the physiology, but if you just keep in mind that TSH has an inverse relationship with thyroid hormones—when it’s high, it suggests that the thyroid is under-functioning, and when it’s low, it suggests that the thyroid gland is over-functioning. Just keep that in mind as we go through the discussion. How prevalent is subclinical hypothyroidism, Amy? Dr. Amy Nett: Well, some estimates are putting subclinical hypothyroidism somewhere in the range between 4 to 20 percent of the US adult population, and you mentioned that’s probably even more common than type 2 diabetes, which based on a 2012 estimate put it at around 9 percent of the US adult population—so type 2 diabetes around 9 percent and subclinical hypothyroidism up to as many as 20 percent. Chris Kresser: Yeah, that’s a big range, and I imagine part of that is differences in how it’s detected and different definitions of subclinical hypothyroidism, but as I’ve written about in my thyroid eBook, the conventional ranges that are used to determine thyroid function are definitely inadequate, and I think if we use the tighter ranges, you’re going to see prevalence that’s at the higher end of that spectrum. Dr. Amy Nett: Yeah, I agree. So you mentioned TSH, and that’s certainly the main marker that we use, and that’s really how we screen thyroid function, so anytime we have a patient joining the practice, we always look at TSH. And the other thing that’s important in the sort of intro to thyroid measurement, how we’re monitoring thyroid function, is understanding that it’s also important to look at the free thyroid hormone levels. When you see a thyroid panel, you’re going to see a number of different measures. It might say total T4, total T3, but what we really measure is the free T4 and free T3. This is because thyroid hormones are actually very strongly bound to proteins in the blood, but thyroid hormones are only active when they’re free, meaning it’s only those free thyroid hormones that bind to the cellular receptors and exert their physiological effect on the cell. Chris Kresser: Right. That’s a great point, and at the same time, every part of the thyroid panel can give us useful information. As Amy mentioned, we start with TSH and total T4 and total T3, and the reason we start with that—I mean, there are a couple of reasons. First of all, those are the basic screening markers. They’re cheap and readily available, and if a patient doesn’t have any thyroid issues, that’s all they’re ever going to need. But also, total T4 is what’s produced by the thyroid gland. The majority—I think over 90 percent—of the hormone that’s produced by the thyroid gland itself is total T4, and then that is later converted into T3, and then the total thyroid hormones are converted into free thyroid hormones. So total T4 and total T3 can tell you a lot about what the thyroid gland itself is actually producing, which is, of course, useful information. And then, as Amy mentioned, you don’t want to stop there because if you just look at total T4 and total T3, you don’t really know what amount of available free thyroid hormone is there to act on the tissues, and that’s ultimately what will really determine peripheral thyroid hormone metabolism and function. So all of these markers give us some information, but free T4 and particularly free T3 are probably the most accurate markers in terms of what’s really happening with thyroid function. Dr. Amy Nett: Yeah, and then just to be complete in terms of what we’re looking at for thyroid function when we’re evaluating for possible hypothyroidism, the other thing you and I always include is looking at antibodies. And specifically, when we’re talking about low thyroid function, we’re talking about antibodies to TPO and thyroglobulin, and these are seen in Hashimoto’s, which, Chris, you’ve talked and written about pretty extensively, and we’re not going to go into that too much today, but it is important to know if low thyroid function is due to Hashimoto’s because that’s an autoimmune condition and we’re going to approach treatment a little bit differently. Chris Kresser: Right. There is another antibody that we will occasionally measure: thyroid-stimulating immunoglobulins, or TSI antibodies, and those are implicated in Graves’ disease, which is the autoimmune condition that causes hyperthyroidism, but again, as Amy mentioned, we’re not going to go into detail on that here because we’re focusing on subclinical hypothyroidism. But just in the interest of being complete, those are all the things that we might want to check for when we do a thyroid panel. So let’s talk a little bit more. I mentioned earlier, Amy, this problem with the laboratory reference range for TSH, so let’s talk a little bit more about that because it’s important. Dr. Amy Nett: It is, and anytime you go to most conventional medicine physicians, and even if you just look at your lab results, you’re going to see that most commonly the reference range for TSH goes up to an acceptable limit of about 4.5, but in functional medicine, we actually consider a TSH of above 2.2 or 2.5 to be elevated beyond the optimal functional range. And, Chris, I think you’ve talked about this in prior podcasts before, how the limit of 4.5 was initially established, taking essentially all comers for lab values, which included patients who hadn’t necessarily been screened for hypothyroidism. Chris Kresser: Yeah, that initial study was on the NHANES cohort, the Nurses’ Health Study. A lot of research has been done on that group, and not only did they not exclude people with undiagnosed hypothyroidism, they didn’t even exclude people with diagnosed hypothyroidism, which just seems crazy. So they took a whole bunch of people and they measured their TSH, but they included people with known and then undiagnosed hypothyroidism, which would skew the range much higher than it should be otherwise. Then more recently, in the last 10 or 15 years, they’ve done studies where they excluded anyone with diagnosed hypothyroidism, which is just basic, but then they also used different methods of screening for hypothyroidism that didn’t involve TSH to determine whether people had undiagnosed hypothyroidism, and if they did, they excluded those people as well. And they basically found that a normal TSH for people that don’t any thyroid problems is somewhere between 0.5 and maybe 2.2 or 2.5, depending on the study that you look at. As you can see, that’s very, very different than 4.5 being the upper end of the limit. Dr. Amy Nett: Yeah, so anytime we see a TSH of above either 2.2 or 2.5, that’s going to be an indicator for us to go ahead and order the rest of those thyroid markers. That’s when we’re going to order the free T4, free T3, and thyroid antibodies. Chris Kresser: And that’s especially true if we see people with thyroid symptoms or symptoms that could be attributed to poor thyroid function. Lab markers, as I’ve often said before, they’re a snapshot in time, and you never want to rely exclusively on lab markers without assessing the entire clinical picture. I mean, of course, there are certain lab markers that are more definitive than others, but in the case of TSH, if we see a TSH of 2.2 but the free T3 and free T4 are totally normal and all the other markers are normal and the person is healthy and doesn’t have any sign of [low] thyroid function, we may still follow up just to be thorough, but we’ll be less likely to consider that an abnormal result because, as it turns out, there is quite a bit of variability in TSH, so why don’t we talk about that a little bit. Dr. Amy Nett: Yeah, there is quite a bit of variability, and before I move on to that, I’m also going to mention for your older listeners that some of the more recent research is suggesting that when we reach our 80s, a TSH of above 3 is actually normal. It seems to reflect probably some age-related changes rather than actual thyroid pathology, but one study even suggested that a higher TSH in people over 80 is associated with lower total mortality. So like you said, we really need to assess these lab values in the context of the whole person, taking age into account and symptoms. Chris Kresser: Exactly. So variability, yeah, let’s talk a little about that. Dr. Amy Nett: Right, because we use TSH as our most common screening tool, but one of the complicating factors is this variability we see in TSH with levels changing by about 50 percent, which is pretty significant when we’re talking of normal TSH values around 2. What this means is if you have, let’s say, an average or a normal TSH of 2, it can measure anywhere between 1 and 3 throughout the course of the day, which would be completely normal. We’ve said that if we see a TSH of 3, we’re going to want to dig in a little bit further, get some more markers, and start thinking about hypothyroidism, but it turns out this is actually completely normal variability. Our thyroid-stimulating hormone has a diurnal rhythm, meaning a daily rhythm, with changes throughout the day. 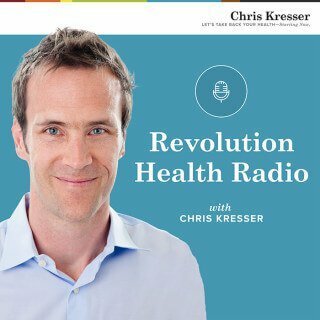 Chris Kresser: Right, and I’m sure a lot of listeners will be familiar with the concept of a diurnal rhythm from cortisol, which we’ve talked about before, one of the hormones produced by the adrenals that’s involved in the stress response, and it’s typically high in the morning and it tapers off throughout the day. And melatonin is produced in the opposite rhythm. So it turns out that TSH has a similar diurnal rhythm. It’s not as clearly defined as the cortisol rhythm, but as Amy said, the crucial thing here to realize is that if you see a TSH of 3, in my mind, that is not yet grounds for diagnosing someone with hypothyroidism or even subclinical hypothyroidism and then giving them medication. That is a sign that more investigation needs to be done. And if you look in the research, you’ll find that in a research setting what’s recommended is to do multiple tests of TSH and then average them out to get a mean value. That is not always practical in a clinical setting, depending on the patient’s availability and resources, but at the least, we want to see two measurements of TSH and preferably more than that before we really decide what’s going on. So when we follow up with the initial thyroid panel where we do TSH and total T4 and total T3 and we order free T3 and free T4 and the antibodies, we’ll always include another TSH there so that we can get at least one more reading and see what’s going on. Dr. Amy Nett: Yeah, that’s a really good point. We never want to initiate treatment based on a single elevated TSH. The more markers we have, the better, but certainly we need to be looking at a minimum of two different measurements. Chris Kresser: Let’s move on and talk a little bit about the clinical consequences of subclinical hypothyroidism. Why does this matter? Why should patients be paying attention to this? Dr. Amy Nett: Absolutely. Well, when we talk about subclinical hypothyroidism, some people with subclinical hypothyroidism certainly experience the symptoms of hypothyroidism. Hypothyroidism has a pretty broad range of symptoms because thyroid hormones affect essentially every cell in our body. They play a particularly important role in determining our metabolism. So some symptoms of hypothyroidism are going to include feeling tired or sluggish despite adequate amounts of sleep. We also see weight gain or weight loss resistance, meaning difficulty losing weight. We also see low mood or depression and other cognitive issues, which might be slowed thinking or brain fog. Another really common symptom is cold intolerance, meaning either having cold hands and feet or you could be the only one in the room wearing a down jacket when everyone else seems comfortable in a short-sleeved t-shirt. We also see constipation, and frequently we can see hair loss and then weak or brittle nails and sometimes dry skin, all reflecting low thyroid function. Chris Kresser: Right. The constipation is interesting, and this is where all of these things can relate. T3 thyroid hormone, which we’ve been discussing, is required to activate intestinal motility and also the production of stomach acid, which then leads to the production of pancreatic enzymes. So as you can see, it plays a really crucial role in digestion because if you’re not producing T3, you won’t get the acid production, the enzyme production, and the motility, and it can lead to not only constipation, but then that can increase the risk of SIBO and other digestive problems. That’s just one example of how even subclinical hypothyroidism can contribute to other issues that can turn into chronic problems. But there are other examples, too, so why don’t we talk about some of those. Dr. Amy Nett: Yeah, and not only that, but as though those symptoms weren’t enough, hypothyroidism can also be associated with an increased risk of cardiovascular disease. That’s another reason it’s important to recognize potential hypothyroidism and initiate proper treatment. Chris Kresser: Some people who are listening might be familiar with the High Cholesterol Action Plan, which is my digital program where I talk about what to do—or not do, in some cases—if you have high cholesterol. In that program, I talked about how back in the ‘60s and ‘70s doctors would use a low dose of thyroid hormone to treat high cholesterol, and the reason for that is that T3, again, one of its many roles is to activate the LDL receptor on the outside of cells. The LDL receptor is what LDL particles bind to, and it removes LDL from the circulation and takes LDL cholesterol and everything else that the LDL particle carries and removes that from the circulation and puts it into the cell. So if someone has low levels of free T3, then they may have poorly functioning LDL receptors, and that can lead to high cholesterol and high LDL particle number. That explains why studies have shown that patients even with TSH levels between 2.5 and 4.5, which, remember, would be considered normal in the conventional paradigm, show improvements in cardiovascular disease risk factors, including lipid profiles, endothelial cell function, which is better functioning of the blood vessels, and decreased thickness of the blood vessels, when their thyroid function improves. So the cardiovascular connection with thyroid hormone and the function of the thyroid system is really important to understand. Dr. Amy Nett: Yeah, and there was actually another really recent study—it was actually just published last month—that looked at another potential, we’ll say, association between low thyroid function and cardiovascular disease risk. Specifically, this study noted that there is an association between subclinical hypothyroidism and atherosclerosis, but they looked a little bit further and specifically looked at the role of oxidation. Oxidation of LDL plays a pretty important role in the development of atherosclerosis or arterial plaques. So this study, again, it looked at oxidative stress in patients with subclinical hypothyroidism, and we just said that oxidation of LDL can make it a more atherogenic form that contributes to the development of those atherosclerotic lesions, and one of the major pathways of LDL oxidation is what’s called the lipoxygenase pathway. This pathway creates certain fatty acid oxidation products known to increase plaques, and they’re considered reliable biomarkers for oxidative stress. So this study looked at lipid peroxidation as measured by concentrations of these specific fatty acids, looked at the association between lipid oxidation, TSH levels, and then the carotid intima-media thickness, and you’ve talked about the IMT before, which is a biomarker of subclinical atherosclerosis. And this study did find that with subclinical hypothyroidism, especially when the TSH got even higher, up to about 10, there was a higher risk of atherosclerosis, and it seemed to be associated with that lipid peroxidation. So another interesting mechanism in terms of how the subclinical hypothyroidism or low thyroid function is contributing to atherosclerosis. Chris Kresser: Absolutely. In the interest of time, we won’t go through too many more examples here, but there are several. The important thing to understand, as Amy said before, is that there are multiple connections between the thyroid system, thyroid hormone, and virtually every other system of the body because of thyroid hormones’ downstream effects on all cells in the body. Changes in thyroid function will affect the endocrine system. It will affect metabolism. It will affect digestion. It will affect cognitive function and mood, reproductive health, etc. You name it, the thyroid system is going to affect it, so this is, again, why even subclinical hypothyroidism is something that’s important to pay attention to. Dr. Amy Nett: And when you mention all that, I think it would be tempting to see, “Well, why not just start low-dose thyroid hormone? If you see a slightly elevated TSH, then just initiate treatment.” But with most things, there really is that sweet spot for not overtreating, and so that’s why we want to be aware of subclinical hypothyroidism and have some guidelines in terms of when to start treatment. One study was done—I think it actually just came out this month—that looked at about 241 women who had subclinical hypothyroidism—it is more common in women—and they looked at TSH levels ranging from about 4.5 to 10, and they were followed up over a five-year period. Of these 241 women with subclinical hypothyroidism, only 19 percent actually went on to require thyroid hormone replacement, and about almost 23 percent had a spontaneous normalization of the TSH, and then more than half of the patients continued to meet the criteria for mild subclinical hypothyroidism but didn’t actually require thyroid hormone replacement. I think this study really supports the option of monitoring thyroid function rather than rushing to initiate treatment because it’s not always indicated. Chris Kresser: A really, really important point, and I just want to emphasize this a few different ways. In functional medicine—you’ve probably heard me say this—we’re always trying to address the underlying cause of a problem. Another way to think about that metaphorically is as a tree. If we’re looking at the tree, we want to be addressing the root of the problem rather than the branch. Now, having said that, in some cases it’s necessary to also address the symptoms, to do something to relieve the symptoms if the symptoms are intense and severe, just to give the patient some temporary relief while we’re continuing to investigate and address the underlying cause or the root of the problem. The second thing to understand that’s important about that—and this is really true in the case of thyroid problems—is that it’s not always black and white that something is a root or a symptom. In many cases, it’s both. If you take thyroid, it can be both an underlying cause of a problem and it can be an effect or a symptom of a deeper problem, and that’s really the trickiest thing about addressing particularly subclinical hypothyroidism. In most cases, for me—I’m curious to hear for you, Amy—when I see subclinical hypothyroidism, I’m usually going to do more investigation into what I consider to be more fundamental pathologies, like gut dysfunction or heavy metal toxicity or mold- or biotoxin-related illness or chronic infection because I know that all of those things can compromise thyroid function and will, in many cases, do it in a way that shows up or manifests as subclinical hypothyroidism rather than frank hypothyroidism. At the same time, if someone comes and they have just grossly abnormal thyroid function and positive antibodies, of course, we’re going to dive right in and start treating their thyroid because in those cases, even if there are other underlying factors that are contributing to the thyroid problem, the patient probably won’t feel better—certainly won’t feel mostly better—if we don’t address their thyroid. I feel like that’s important to point out because it explains why you don’t necessarily want to jump in with thyroid hormone replacement right away early in the process. Dr. Amy Nett: Yes, I would agree absolutely that whenever I start thinking about hypothyroidism, I really want to start, as we’ve talked about, peeling the layers of the onion and seeing what’s going on underneath, where else can we address inflammation, where can we modulate the immune system. But having hypothyroidism myself, I can tell you from personal experience it feels pretty miserable, so if I see someone with enough symptoms that are really consistent with hypothyroidism, I probably will initiate some treatment. It might be with a very low dose of thyroid hormone, but really using it as a bridge because it takes a little bit of work and it can take a little bit of time to figure out what the true root cause is. Chris Kresser: Absolutely. Whether you do something to address the thyroid issue in the meantime while you’re continuing to explore those root causes, that’s really just a clinical judgment call. There’s room for different approaches with different people depending on your preference and the patient’s preference, and you may want to experiment with some different forms of thyroid hormone replacement initially or other things like just supporting them with nutrients that are beneficial for thyroid function, especially if they’re low in any of those nutrients. Dr. Amy Nett: Yeah, there are a lot of different approaches, and I think the take-home point from that is that it’s definitely something to consider, but I rarely consider it the answer, and it’s just whether or not it can be useful as a bridge. But there are so many different ways to support the thyroid, and I’m seeing that in the majority of our patients who initially have labs consistent with subclinical hypothyroidism, most often we are able to bring those numbers back into range by treating the underlying cause. Chris Kresser: Just for a little perspective on why it’s important not to overtreat—you mentioned, Amy, why don’t we just dive in and start treating right away? Well, there’s often a cost to that. If you undertreat, there’s a consequence, and if you overtreat, there’s a consequence, and thyroid function is no different. Even subclinical hypothyroidism, which is really kind of mirror of what we’re talking about now, where you have a TSH that’s below the reference range and normal free T4 or free T3 or maybe high-normal T4, has been associated with poor cognitive outcomes in studies, and this makes sense because the thyroid system is really kind of the idle of our engine, if you want to think of it that way, like if you pull up to a stop sign in your car and it’s idling there. If the idle is too low, then the car’s going to be shaking and it’s not going to run correctly, but if the idle is too high, the life of the engine is going to be shorter. It’s going to burn itself out more quickly, and that’s exactly kind of what the thyroid system does for us. We see a lot of patients who come to us and they’re overmedicated, so they’re taking a higher dose of thyroid hormone than they should, and they’re not often aware of this. Their TSH is suppressed sometimes even to zero or as close to zero as you can possibly get, and that’s a concern because that can increase the risk of stroke, and it can impair cognitive function, as I just said with the study, and it’s a reason that you need to be cautious and not cavalier in terms of what you do with thyroid hormone replacement, whether you’re talking about using drugs or desiccated thyroid that you can get over the counter or anything that affects thyroid function. Dr. Amy Nett: Right, and as you mentioned, there are also so many different ways to support the thyroid, and especially once we start seeing subclinical hypothyroidism, different ways to approach that. One, I think, really interesting and kind of exciting study that came out—again, it just came out this month—looked at the role of Hashimoto’s thyroiditis and oxidative stress parameters, looking at patients who had evidence for Hashimoto’s and then had normal thyroid function, subclinical, and overt hypothyroidism. They found that total oxidant levels and oxidative stress index levels were higher and that total antioxidants—so antioxidants being beneficial, the total antioxidant status—were lower with overt hypothyroidism. So overall, we saw that indicators of oxidative stress would increase and antioxidant markers would decrease pretty significantly in each phase, going from normal thyroid function to subclinical hypothyroidism to overt hypothyroidism in these various subgroups of patients with Hashimoto’s. This suggests that oxidative stress increases continuously during the development of hypothyroidism, so this is going to be a really interesting area to follow up on because it certainly begs the question as to whether antioxidant treatment could actually help prevent progression to overt hypothyroidism. Chris Kresser: Or simply dietary and lifestyle changes that reduce the likelihood of oxidative stress happening in the first place. Oxidative stress—along with inflammation—is characterized as basically every modern inflammatory disease that we know about, and oxidative stress goes hand in hand with the modern diet and lifestyle, so eating a lot of highly refined and processed industrial seed and vegetable oils and refined flour and sugar, not exercising at all, not exercising enough, too much sitting, exposure to environmental toxins, like heavy metals and BPA, not sleeping enough, not managing your stress—all the things that we talk about all the time, these are all contributing factors to oxidative stress. I think one of the important takeaways from this is that improving thyroid function, we often think of things like thyroid hormone replacement or desiccated thyroid or even nutrients that support thyroid function, like zinc and selenium and iodine, but there are certainly other things that are important to consider, too, like we just mentioned. If oxidative stress is a contributing factor, and someone is eating a standard American diet and following a standard American lifestyle, then it’s entirely possible that switching to a nutrient-dense, paleo type of diet, getting more sleep, adding more physical activity to their routine, and doing some meditation or mindfulness practice could have a significantly positive effect on thyroid function without taking a single pill or any medication at all. Dr. Amy Nett: Exactly. I think to sort of summarize a lot of what we’ve been covering, it’s really the idea that subclinical hypothyroidism, we need to be aware of it in part because it may progress to overt hypothyroidism, it can be associated with some of the symptoms of frank hypothyroidism, including the complications such as cardiovascular disease, and while we need to be aware of it, we don’t always need to start treatment with thyroid hormone replacement. There are a lot of different ways to address thyroid health. I hope this has been helpful. It’s definitely an emerging field. You can see studies being published on it all the time, and we’ll keep up with the research as we always do and with our own clinical experience and what we’re experimenting with and figuring out in our work with patients. I want to thank you, Amy, for coming on the show again and talking about this. It’s always a pleasure, and I look forward to having you back next time. Dr. Amy Nett: Well, thank you. I look forward to coming back. Chris Kresser: All right, and Amy, I think, has a few spots for new patients right now. She’s getting almost completely full, and unfortunately, I had to close my practice to new patients again recently. But if you do need help with this kind of thing, Amy is fantastic. I can’t recommend her highly enough, and hopefully she’ll still have a few spots left before her practice fills as well. Dr. Amy Nett: Absolutely. I am still accepting new patients, so I would always be happy to work with anyone new. Chris Kresser: OK, so you can get more information about how to work with Amy at CCFmed.com. That’s the California Center for Functional Medicine website, our clinic website. That’s it for this episode. Again, if you enjoy the show, make sure to leave us a review on iTunes. It really helps spread the word. And for more information, a free eBook on thyroid function you can find at ChrisKresser.com, a lot of articles that I’ve written over the years condensed into one eBook that we’re offering for free there, so check it out if you’re interested in this topic. OK, thanks, everyone, for listening. Talk to you next time.